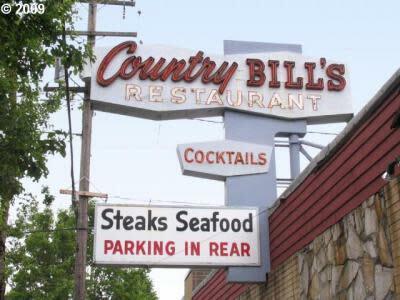 Country Bill’s is for sale? I want it! A bar so cool I’ve kept it a secret. Until now. Hats off to drinking buddy Leland Hanson for spotting this in the real estate listings. Holy cow! Country Bill’s in Woodstock is for sale? I must have it. How much do I love Country Bill’s? Let’s put it this way: I’ve been writing about bars and booze in this town for almost a decade and I’ve never mentioned it in print. Why? Because it’s mine and I didn’t feel like sharing. It’s 5300 square feet of classic steakhouse (great rock facade!) with vintage red tuck ‘n’ roll upholstery that’s maintained a faithful contingent of waitresses and cooks since 1964! Now that’s cred you can’t put a price on. The asking price is almost a million-four, but I bet I can talk ‘em down. What I’m saying is, I’m looking for investors who want to own one of the last remaining pieces of pure, unvarnished Portland before it gets bulldozed to make way for more condos nobody wants. Come on! Who’s with me?